If you were given a second-chance at life, would you take it? Even if you willingly ended your own life? Irritum from developer Nicolas Padgett faces you with one such quandary. You take the role of a deceased man who ends up in in a sort of limbo, wherein he’s offered another chance at life. The road to recovery’s a long and perilous one, however, many trials standing in your way. Though it’s a bit frustrating at times, Irritum’s compelling premise and ample challenge create an intriguing, engaging platformer. Two otherworldly figures – Sollus and Cassus – guide you through this ordeal, both having different ideas of how to achieve resurrection. Sollus believes memories are unimportant, that retrieving them is tantamount to failure. Cassus thinks otherwise, however, suggesting that remembering one’s self is key to regaining life. The opposing views of these two cause you to question who’s telling the truth, whether there really is a way out of this. Both appear in every stage to try bringing you to their side, either through callousness or by calmly urging you on. Whichever path you choose determines the outcome. On the subject of memories: death has left the protagonist’s mind in disarray, you see; memories lost and physical and mental faculties made dormant. They now lay scattered about this strange plane, represented by small misty clouds settled in precarious zones, making them difficult to obtain. Collecting memories grants context on the events that lead the protagonist to suicide. Voice samples echo through the area upon grabbing them, but they’re barely audible. They’re best read from the main menu. Purgatory manifests itself as a series of semitransparent, primary-colored platforms. An endless rainfall and boundless expanse of darkness conveying the area’s dreary tone. Your goal is to reach the columns of light at the end of every stage, reactivating the brain to unlock new abilities allowing you to progress further. Each latent part of the mind introduces a new mechanic or skill. At first, it’s changing which colored pedestal solidifies. Eventually, you can create a clone of yourself. 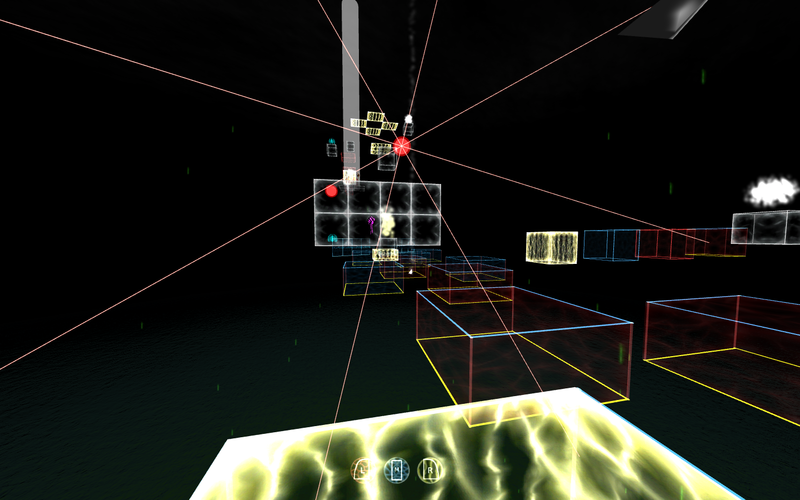 The brain also creates new obstacles: moving platforms, timed color-swaps, lasers, etc. The further you delve, the more resistance you face. Though the aesthetics are simple, they’re no less effective. Most of the hurdles present a fine challenge. Despite the float-y jumps, you have a fine level of control over your avatar’s movement. He occasionally slips around due to leftover momentum, but it’s easy to work around. Just takes some getting used to. And should you fall, frequent checkpoints ensure you never lose much progress. Some of the obstacles just don’t plain work, though. About half-way through the game you come across platforms that change hue at regular intervals. One second, it could be red; the next, blue. Simple enough, yeah? Yeah. Only, the way Irritum communicates the swap doesn’t work. A steady tick-tock that grows louder as you get closer to the platform informs you of the coming adjustment. But it’s never clear which tick or tock signals the change. A problem compounded by the fact that the swaps occur at seemingly random times. In one instance, it’ll take a few seconds. In another, it takes over 10 seconds or more. Never do you get a sense of when you’re supposed to jump and activate another color because there’s no pattern. They act of their own free will, leaving you at a constant loss as you try time and again hoping desperately for luck to shift in your favor. Thankfully, such cases are rare (only happened a few times), the platforms perfectly cooperative most of the time, as the larger variety move on a set, clearly defined schedule. It’s the smaller tiles that act haphazardly. 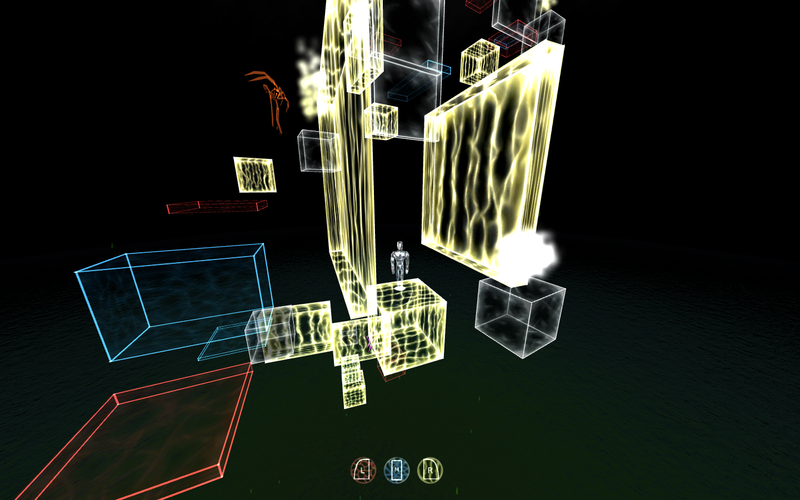 Irritum’s 40 stages are quick, each able to finished in a couple minutes apiece should you face little trouble. Running straight for the exit makes for a brief experience, but a more relaxed one as well, allowing you to focus squarely on progression only taking on whatever obstacles stand between you and the finish line. Seeking out all the memories brings additional challenge, as they’re all tucked away in tight spots. 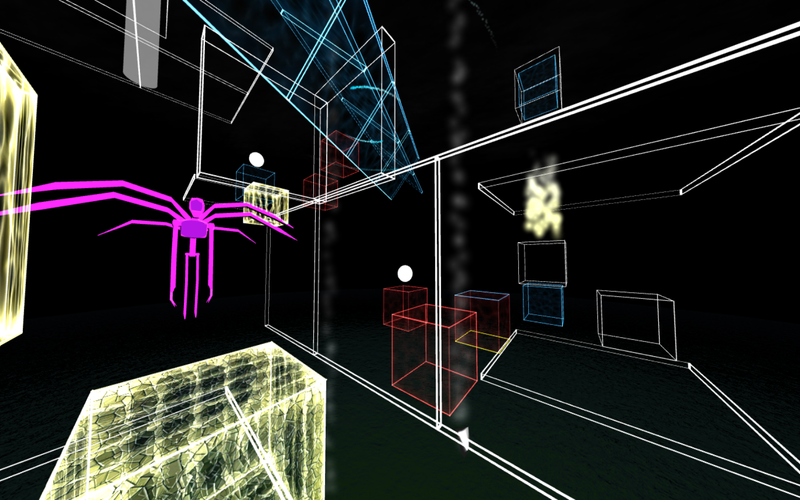 Some of Irritum’s toughest sections come from hunting down memories, demanding quick jumps and color swapping to succeed. They’re all reachable with some effort, though a few border on tedium due to the ultra-precise maneuvers they require, leaving almost no room for error. If you’re looking for an even greater trial, the game’s “one-life” mode does the job nicely. But otherwise, once you’ve seen the two endings and read all the memories, you’re time with Irritum will be at its end. It doesn’t overstay its welcome, wrapping things up just as you start feeling ready for the end. It remains engaging enough on further playthroughs just long enough to see all it has to offer. Whether or not you seek out everything Irritum has, however, depends on how much time you wish to spend in limbo.